Moving from a filthy brothel to a fine manor house, from the world of street fighters to the world of champions, The Fair Fight is a vivid, propulsive historical novel announcing the arrival of a dynamic new talent. Born in a brothel, Ruth doesn’t expect much for herself beyond abuse. While her sister’s beauty affords a certain degree of comfort, Ruth’s harsh looks set her on a path of drudgery. That is until she meets pugilist patron George Dryer and discovers her true calling—fighting bare knuckles in the prize rings of Bristol. Manor-born Charlotte has a different cross to bear. Scarred by smallpox, stifled by her social and romantic options, and trapped in twisted power games with her wastrel brother, she is desperate for an escape. After a disastrous, life-changing fight sidelines Ruth, the two women meet, and it alters the perspectives of both of them. When Charlotte presents Ruth with an extraordinary proposition, Ruth pushes dainty Charlotte to enter the ring herself and learn the power of her own strength. 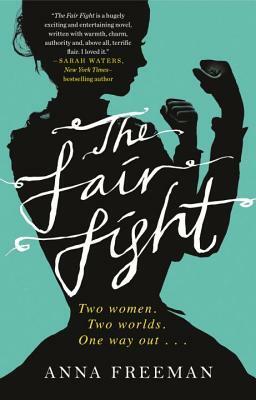 A gripping, page-turning story about people struggling to transcend the circumstances into which they were born and fighting for their own places in society, The Fair Fight is a raucous, intoxicating tale of courage, reinvention, and fighting one’s way to the top. Anna Freeman supported herself during the writing of this book by bartending at the Hatchet Inn in Bristol, the very pub where this female pugilism took root over two hundred years ago. This is her first novel. She lives in Bristol.